This is the first part of the introduction of my dissertation Arranging Reality. 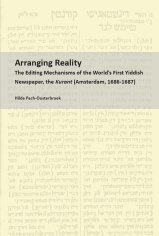 The Editing Mechanisms of the World’s First Yiddish Newspaper, the Kurant (Amsterdam, 1686-1687). 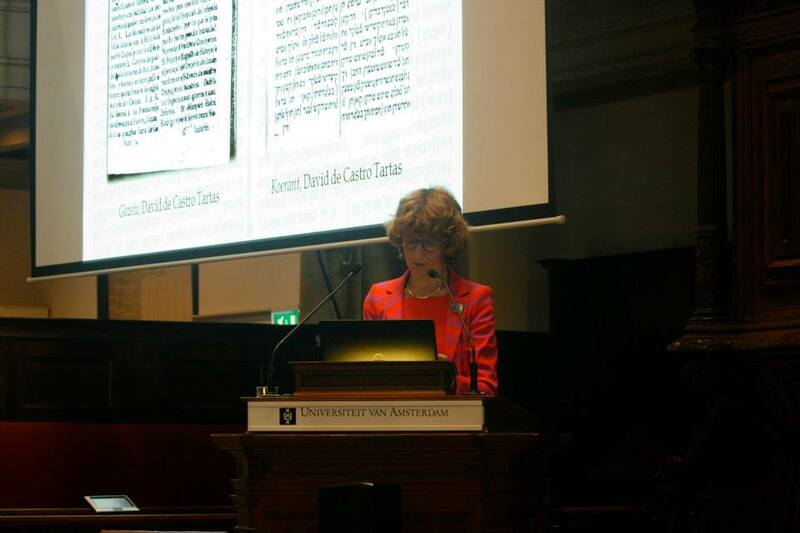 University of Amsterdam 2014. If you click on this link, you will see the official title page and the link that leads you to the digital version of the dissertation. Dit is het begin van de inleiding van mijn proefschrift Arranging Reality. The Editing Mechanisms of the World’s First Yiddish Newspaper, the Kurant (Amsterdam, 1686-1687). Universiteit van Amsterdam 2014. Als je op deze link klikt, zie je de officiële titelpagina met daarop de link die je naar de digitale versie van het proefschrift leidt. Achter in het proefschrift staat een Nederlandse samenvatting. In the summer of 1902 David Montezinos (1828-1916), book collector and librarian of Ets Haim, the library of the Portuguese synagogue in Amsterdam, bought a book from a street peddler while watching Amsterdam’s Flora Theater burn. It was a volume containing one hundred issues of a Yiddish newspaper printed in Amsterdam, the Kurant, the Newspaper, dating from August 9, 1686 to December 5, 1687. It turned out to be the oldest known Yiddish newspaper in the world and to date it is the only Yiddish newspaper of which more than a few issues have survived before the East-European Yiddish press came into being in the nineteenth century. The Kurant carried news from all over the world, apparently translated from Dutch newspapers. From August 9, 1686 until June 3, 1687 it was printed and published by the Ashkenazi printer Uri Faybesh Halevi, and from June 6 until December 5, 1687 the printer and publisher was the Sephardi David de Castro Tartas. The compositor, and probably also the translator and editor, was the ger – convert to Judaism – Moshe bar Avraham Avinu, or, as it probably was pronounced, Moushe bar Avrom Ovinu. The Kurant usually appeared twice a week, on Tuesdays and Fridays; between December 6, 1686 and February 14, 1687 and from August 8, 1687 until the last known issue of December 5, 1687 it appeared once a week (on Fridays). It is not known whether more issues have existed than those in this volume. As far as we know, before Montezinos’s purchase neither he nor his fellow scholars in the Netherlands and abroad had had any idea that this newspaper had existed. Several of them wrote about the discovery of the Kurant. The first to write about the Kurant was Sigmund Seeligmann. In his article Seeligmann gives a brief description of the Kurant and indicates that Montezinos acquired the volume shortly before the time of writing (1902). Seeligmann writes he will not elaborate because Montezinos himself intends to write about the newspaper. However, it seems Montezinos never did so. After his death in 1916 the book with the Kurant stayed in Ets Haim. In 1935 Montezinos’s assistant and successor, Jacob da Silva Rosa (1886-1943), shed light on the treasure in his library in the Dutch Jewish weekly Nieuw Israelietisch Weekblad. Two years later the American Yiddishist Jacob Shatzky translated the Dutch article into Yiddish and added some critical remarks . In Da Silva Rosa’s eyes, the Kurant was a newspaper carrying world news in Yiddish, for a Jewish readership that was yet unable to read the Dutch newspapers, as the Gazeta de Amsterdam (1672-1702) was for Spanish-speaking Sephardic Jews. First he gives a brief overview of the historical events in the period that the Kurant was published. Then he gives some technical details of the Kurant and information about the printers and the compositor, followed by a description of its content. Like Weinreich, he pays a lot of attention to the Jewish news. In an epilogue, Jacob Shatzky contradicts Da Silva Rosa’s remark that the Kurant was not mentioned in the scholarly literature and gives 21 titles. He also remarks that Da Silva Rosa is wrong in assuming that the Gazeta was a model for the Kurant. In the first place, writes Shatzky, because the editor undoubtedly did not speak Spanish, and in the second place because Shatzky found out that the Haerlemse Courant existed at the time, which was a much more likely example for the Kurant. In the Second World War the books of Ets Haim, including the volume containing the Kurant, were transported to Germany. In 1946 they returned to Amsterdam. In 1969 the Kurant was part of an exhibition in the Anne Frank House, ‘Jewish Press in the Netherlands and in Germany 1674-1940’. In the introduction to the catalogue, L. Fuks mentions the Kurant and calls it ‘a Jewish newspaper in the full meaning of the word, which, besides general political news, pays a lot of attention to domestic and foreign Jewish news.’ He also mentions the fact that the Kurant sometimes appeared on Tuesdays, but always on Fridays. He sees this as the beginning of a still extant tradition. The exhibition in the Anne Frank House was the first and the last public appearance of the volume containing the Kurant. In the seventies it disappeared without trace. Possibly it was among the books that were transferred from the Ets Haim library to the Jewish National and University Library in Jerusalem in 1978, yet it seems it never arrived in Jerusalem. It may have simply been stolen from Ets Haim. Did someone take Max Weinreich’s remark too seriously? Fortunately, photos and photocopies of the papers can still be found in the Bibliotheca Rosenthaliana of the Universiteit van Amsterdam, while microfilms are kept in the City Archives in Amsterdam and in several libraries in the Netherlands and abroad. After its disappearance the Kurant continued to stir the curiosity of scholars. The most extensive piece was written by Shlomo Berger. Berger summarizes the literature on the Kurant, information on the printers and the compositor/translator/editor, and a description of the appearance and the content. According to Berger, the main sources are Dutch newspapers, especially those from Amsterdam and Haarlem. He is also, like Toury, Lifshitz, Fuks and Fuks-Mansfeld, of the opinion that the compositor used letters sent to Amsterdam by Jews from abroad for reports on Jewish communities. It is hard to tell with certainty who were the readers of the Kurant, according to Berger. Dutch newspapers were mainly read by middle-class merchants, he writes, whereas the majority of the Dutch Ashkenazim were poor and therefore probably unable to subscribe. The articles mentioned above give ample information about the Kurant. To a great extent this information is descriptive. When did it appear, how did it look, what did it write about, by whom was it published? Some authors also mention probable sources or try to identify its readers. However, they do not answer the question that to me seems the most important: what did the printers and/or the compositor/translator/editor want with the Kurant; with what representation of reality did they want to confront their readers? Although newspapers in the seventeenth and eighteenth century often used the same sources and sometimes copied each other’s texts, each retained its own character. They were hardly voicing opinions, yet by selecting certain reports and leaving out others, by stressing certain subjects more than others, they ‘arranged reality’ in a specific way and thus presented their readers with a certain view on what was happening in the world. Studies on this aspect of press history are scant, both in the Netherlands and abroad. One important case study is Marcel Broersma’s insightful history of the Leeuwarder Courant between 1752 and 2002. Broersma presents his study as a search for the identity of the newspaper. In order to be convincing and successful, says Broersma, a newspaper had, and still has, to connect with its readers; newspaper and reader need a common frame of reference. Of course journalists do not know all their readers personally and they do not always have a specific type of reader in mind when they publish their newspaper. However they often belong to the same socio-economic and cultural group as their readers and so more or less know what their readers feel and think. Thus they are able to create, in the words of Benedict Anderson, an ‘imagined community’ of readers. Anderson, in his study on nationalism, uses this concept to explain how people can be convinced to belong to a nation and mentions newspapers as a tool for that. Broersma argues that ‘imagined community’ can also be used to denote other kinds of territorial, religious, linguistic or political communities. Thus, when people read a newspaper that appeals to them, they can get the feeling that they belong or should belong to a community that shares certain characteristics or values, like language, nationality, religion or political views, even though they do not know all members of the community personally. Both Anderson and Broersma concentrate on the period between the eighteenth and the twentieth century, so the question is: can we use the concept of the imagined community to draw conclusions about the identity of the readers of the seventeenth-century Kurant and of the Kurant itself? Eisenstein states – as does Anderson himself – that in sixteenth- and seventeenth-century Europe the use of the vernacular in printed texts was an important agent in the formation of group identities: ‘Printed materials encouraged silent adherence to causes whose advocates could not be found in any one parish and who addressed an invisible public from afar. New forms of group identity began to compete with an older, more localized nexus of loyalties.’ Eisenstein’s definition of these forms of group identity bears a great resemblance to Anderson’s concept of the imagined community. But is the concept of the imagined community applicable to the Jewish case? Historian of the Jewish book Zeev Gries thinks not. He remarks that Jews in the Diaspora had several languages; the linguistic factor uniting the Jewish people was not the vernacular language, but the sacred language, Hebrew. That is, according to Gries, why until the eighteenth century the publication of Yiddish books lagged behind compared to Hebrew ones. He thinks Jews shared the sense of a living community long before other peoples in Europe and so did not need an imagined one. Shlomo Berger recognizes that Hebrew was the marker of identity for Jews all over the world, yet he sees Yiddish as a powerful Jewish language that had the potential to foster cohesion among various Ashkenazi communities and thus also supported the formation of an Ashkenazi diaspora. The growing distribution of books became a crucial factor in the standardizing of Yiddish and made it a central communication instrument within Ashkenazi society and culture. Even though the Yiddish book production amounted to around ten percent of the books produced in Hebrew type, the impact was probably far greater than that of Hebrew books. In a German- and Dutch-speaking environment, Yiddish was also able to function as mediator between the Jewish world and surrounding society. Thus, it seems possible, after all, to apply the concept of the imagined community to the Ashkenazi Jews in Amsterdam and perhaps in other parts of the Dutch Republic as well. At the time the Kurant was published most Ashkenazi Jews had been living in Amsterdam for only a few decades, having arrived mainly from Germany and Poland, and they were still in the process of becoming a community. Of course they had long been part of the community of all Diaspora Jews, Hebrew being its uniting linguistic factor, as Gries remarks. Before they settled in Amsterdam, they already were part of the community of the Ashkenazi diaspora, in which Yiddish was the uniting linguistic factor, as Berger states. After their settlement in the Netherlands a new aspect was added to their identity: they became inhabitants of Amsterdam and the Dutch Republic. Although they lived in their own quarters, ghettos were absent and many of them were surrounded by and frequently got in touch with non-Jews. A newspaper in Yiddish might have helped its readers create the feeling of belonging to a specific community of Amsterdam or Dutch Ashkenazi Jews by giving them the opportunity to form opinions both about the non-Jewish world around them and about their own place in this world, in their own vernacular. The question whether the Kurant indeed created this feeling is not easy to answer. Broersma’s study covers 250 years and has at its disposal a statement of principles by the founder. In the eighteenth century the Leeuwarder Courant probably took its foreign news from other newspapers, but also employed their own reporters and contributors. The archives offer information about the readers, about the circulation of the newspaper and several other aspects. This, together with a systematic analysis of the newspaper’s content, enables Broersma to conclude that the Leeuwarder Courant welcomed ‘civilized progress’ and propagated the idea that every human being was obliged to develop into a valuable citizen. The Kurant, and, more specifically, its editor, ‘arranged reality’ by selecting and editing the material from the sources. What can the selecting and editing mechanisms of the Kurant tell us about the intentions of its makers and about the kind of imagined community of readers the Kurant may have helped create? I am not suggesting that the makers of the Kurant published the newspaper with the idea of creating an imagined community of readers. Imagined communities, both in the strict and in the broader sense, are generally observed by historians in hindsight. The printers of the Kurant probably decided to publish a newspaper because they hoped it might become a commercial success. For it to be a commercial success, the editor had to select and edit the material from the sources in a way that appealed to the intended readers, a way that made, to some extent, that they could identify with its view on what happened in the world, and gave them the feeling that the Kurant was their newspaper. Da Silva Rosa, ‘David Montezinos’, 4. The Flora-Theater, in the Amstelstraat, burned down on August 29, 1902: Van de Kamp & Van der Wijk, Koosjer Nederlands, 158. In the period the newspapers were printed by Uri Faybesh Halevi one issue is called Kuranten (plural), not Kurant. From the moment that David de Castro Tartas took over all further issues were called Kurant. Here I will use the word Kurant; only when referring to a specific issue printed by Halevi I will use the name Kuranten. The newspaper is often referred to as the Dinstagishe un Fraytagishe Kuranten, because it appeared on Tuesdays and Fridays. However, this was not the official name. A Tuesday issue bears the heading Dinstagishe Kurant(en), a Friday issue Fraytagishe Kurant(en), just as Dutch newspaper issues are called Haerlemse Dingsdaegse Courant or Amsterdamse Donderdaegse Courant. Yet in general those newspapers are referred to as Haerlemse Courant or Amsterdamse Courant, without the name of the day. The other ones are the Dirnfurter Prifilegirte Tsaytung (Dyhernfurt (near Breslau), December 13, 1771 and January 10, 1772), the Vokhentlikhe berikhtn (Amsterdam, January 10, 1781) and the French Tsaytung, (Metz, 1789 and 1790): see Ch. 11. Some call the Kurant the oldest Jewish newspaper (e.g. Fuks, Joodse pers), others (notably Schnitzer, ‘Gazeta’) argue that this title belongs to the Spanish-language Gazeta de Amsterdam, also printed by David de Castro Tartas, of which the first known issue was published in 1672. Although the Gazeta was not Jewish in character, its readership was probably mainly Jewish: see Ch. 3. In the issues printed by Halevi, he is referred to as hamesader (‘the compositor’); in the issues printed by Tartas only his name is mentioned. And once on Thursday, April 3, 1687: see 5.7. Seeligmann, ‘Jüdische Ansiedelung’, 7-8. Sigmund Seeligmann (Karlsruhe 1873-Amsterdam 1940) was a historian, bibliographer and the founder of the Genootschap voor de Joodsche Wetenschap in Nederland. Already in 1889, Montezinos had donated his book collection to Ets Haim. From that moment the library was called Ets Haim – Livraria Montezinos. Apparently this did not prevent him from buying new books, like the volume containing the Kurant. E.g., on p. 681 he quotes from the issue of February 24, whereas it should be September 24 (1686). He also writes, on p. 679, about one of the successors of the Kurant, the Dirnfurter Prifilegirte Tsaytung. According to him it dates from 1742, whereas the two issues we know date from 1771 and 1772. Da Silva Rosa, ‘Een Amsterdams-Joodsche Courant’, 14-15. Da Silva Rosa, ‘Di kurantin’, 7-19. Da Silva Rosa, ‘Di kurantin’, 17-19. The majority of them are short mentions in Yiddish articles, but his list includes Seeligmann, ‘Jüdische Ansiedelung’ and Weinreich, Di bobe as well. Da Silva Rosa, ‘Di kurantin’, 19. Although Shatzky does not tell what he means by ‘model’ and ‘example’, he seems to suggest that according to Da Silva Rosa the Gazeta might have been a source for the Kurant. However, what Da Silva Rosa says on p. 8 is: ‘Therefore we should not be surprised that just like the Sephardic Jews with their Gazeta de Amsterdam, the Ashkenazi community had, half a century after their consolidation, a newspaper of its own.’ This seems to be a sensible remark, which is not inconsistent with Shatzky’s arguments. Whether or not the Gazeta served as a model, an example or even a source for the Kurant, I will discuss in Ch. 3. I would like to thank Abraham Rosenberg, former curator of Ets Haim – Livraria Montezinos, Dr. Adri Offenberg, former curator of Bibliotheca Rosenthaliana, and Prof. Emile Schrijver, curator of Bibliotheca Rosenthaliana, for sharing their information and conjectures. Berger, ‘Reshit ha’itonut beyidish’, 363-371. Other articles are: Braber, ‘Strijdtoneel’, 13-15; Cahen, ‘Cradle’, 17-23; Lakmaker, ‘Dienstagische oen Freitagische Koerant’, 9-11; Lifshitz ‘Tsum 300–yorikn yoyvl’, 127-133; Weinstock ‘Origines’, 164-174; and from before the disappearance: Toury, ‘Reshit ha’itonut hayehudit’, 310-327. Fuks-Mansfeld, ‘Yiddish Historiography’, 9; L. & R. Fuks, ‘Yiddish Language and Literature’, 42. In Ch. 7 I will show that this is probably incorrect. See Ch. 3 for a survey of Dutch press historiography. Broersma, Beschaafde vooruitgang. I would like to thank Prof. Frank van Vree for bringing Broersma’s book to my attention. Broersma, Beschaafde vooruitgang, 18-19; Darnton, Lamourette, 62. Anderson, Imagined Communities, 35, 37-46. Gries The Book, vii-ix. Gries here – intentionally? – misunderstands the concept of ‘imagined’. Anderson does not use the word as opposed to ‘real’. The community is imagined because its members ‘will never know most of their fellow-members, meet them, or even hear of them, yet in the mind of each lives the image of their communion.’ (Anderson, Imagined Communities, 6.) In this sense Gries’s ‘living community’ is also an imagined community. Berger, ‘Reshit ha’itonut beyidish’, 68-86.